A three year old boy received life threatening injuries after he was accident driven over by a full-sized pickup truck Saturday evening 31-January. 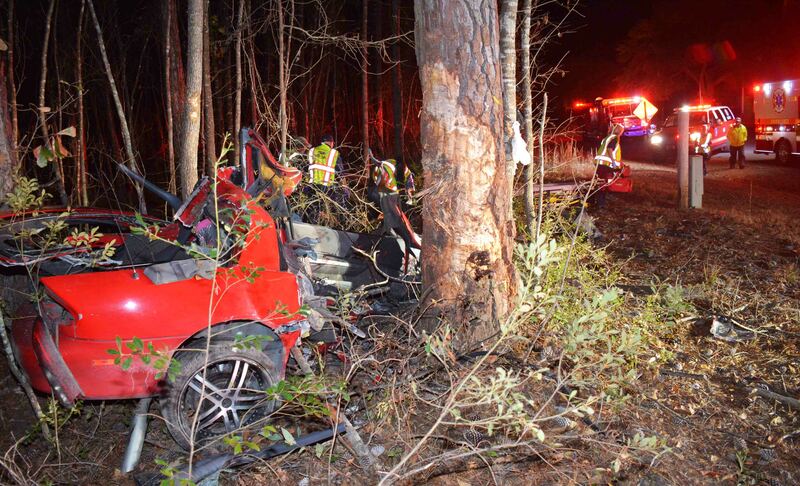 9-1-1 was notified at 21:40 of the low speed accident that occurred in a yard in the 900 block of Logan Farm Road. The small child was carried back into the residence. Click here for more information. 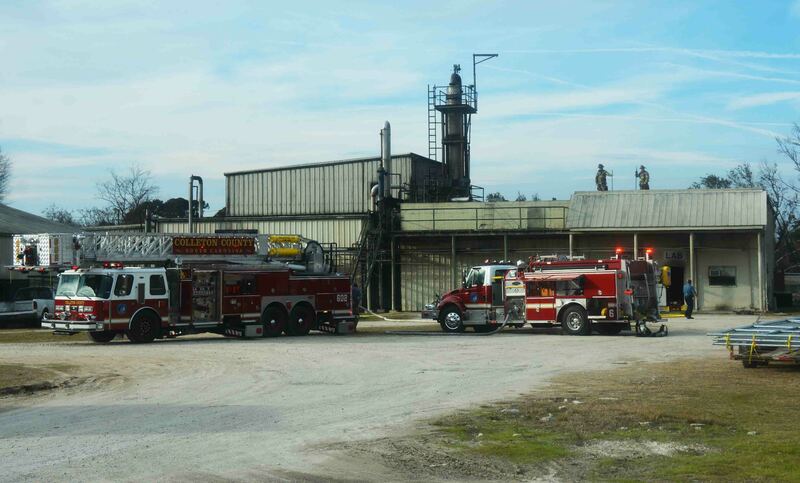 At 15:30, 29-January Fire-Rescue units were sent to the Innophos Nutrition facility at 88 Weiss Lane for a fire in the Laboratory. Engine 6 arrived to find light smoke coming from the two story industrial building. Employees had safely exited the building. Firefighters deployed one 1-3/4 handline and found heavy fire conditions in the small lab. Click here for more information. An adult male received a self-inflicted single GSW to the abdomen at a Quail Creek home Thursday afternoon 29-January at 14:46. Firefighter-Paramedics quickly treated the man at the scene and placed a medical helicopter on standby. 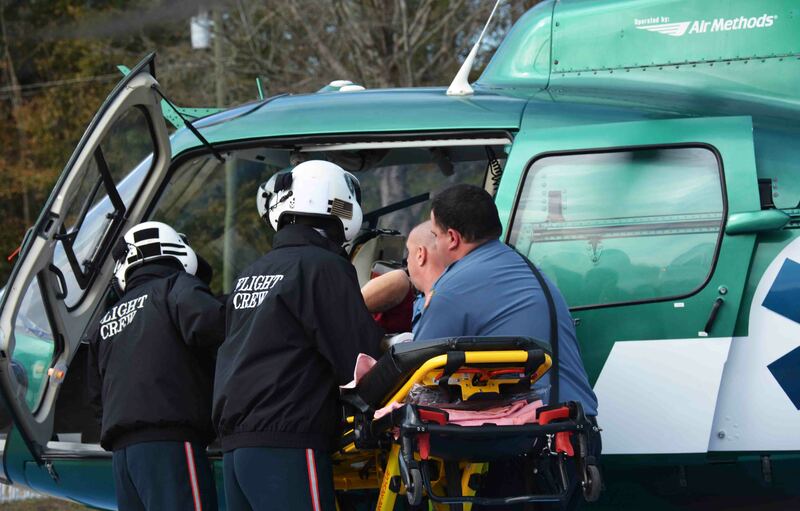 He was rapidly transported to the helipad at Colleton Medical Center to meet with LifeNet 4. Click here for more information. A First Aid/CPR class will be held at Station 19 on Thursday, February 19, 2015 at 18:00 hours. This class is a required pre-requisite to take the 1153 - IFSAC Firefighter I Course. If you are interested in attending, please contact the training division at (843) 538-6849 or koxner@colletoncounty.org. 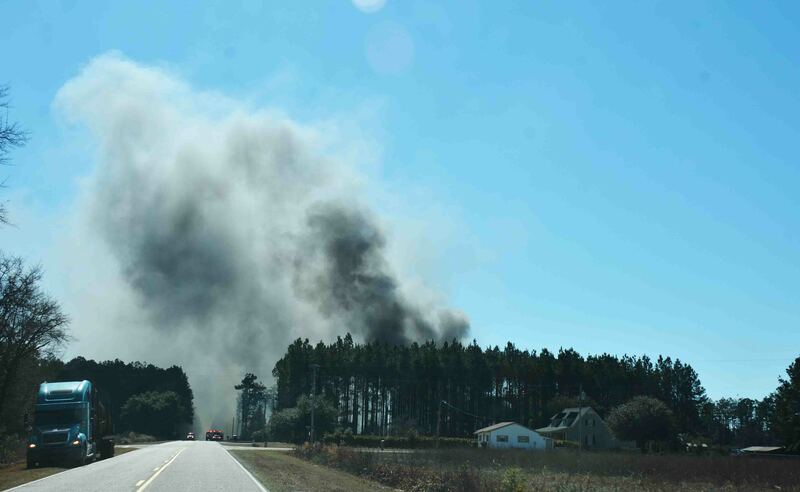 Two buildings were destroyed and a third received extensive damage in a midafternoon fire at 8837 Lowcountry Highway (US Hwy 21) Wednesday 28-Janaury. At 12:38, 9-1-1 Operators began receiving reports of a building on fire at this location. Engine 13 arrived to find three buildings ablaze, a rapidly moving multi-acre woods fire driven by moderate winds and a residential dwelling endangered. Click here for more information. A family of five were displaced after a fire destroyed their Avalon Drive home, north of Williams Tuesday morning 27-Janaury. 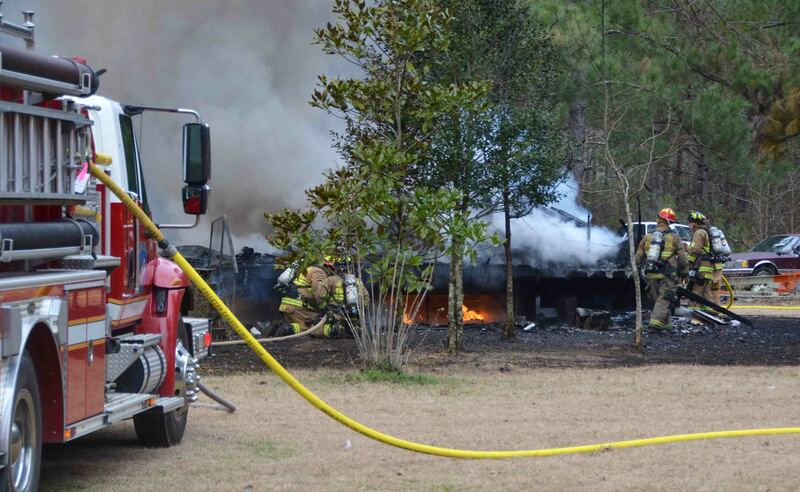 At 09:22, several callers to 9-1-1 reported the home was fully involved. Engine 4 arrived at 61 Avalon Drive to find the residence engulfed in flames and a portion of the structures had already collapsed. Click here for more information. 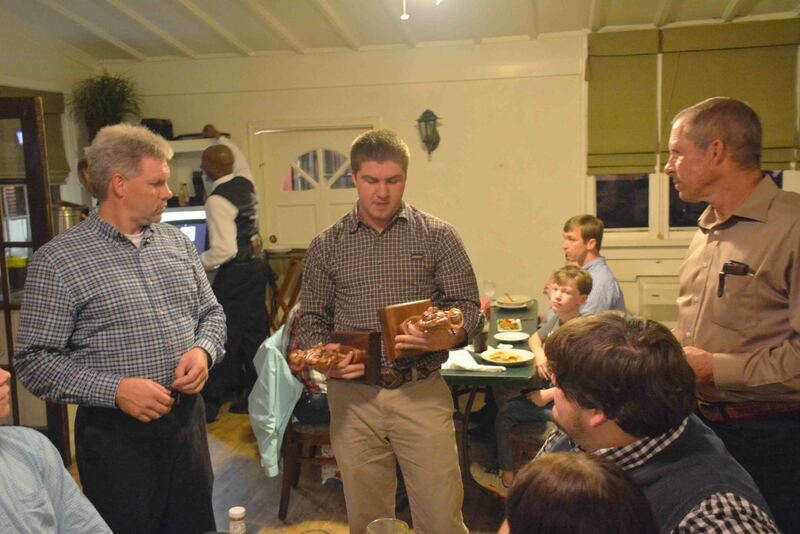 Station 2 personnel presented Commissioner S.G. Drew and Captain Shane Rushton with 20 year service awards during the Station’s Annual dinner held in Summerville Friday, 23-Janaury. Drew and Rushton both joined the station in 1994 and were instrumental in bringing the station in Jacksonboro through some turbulent times. Click here for more information. 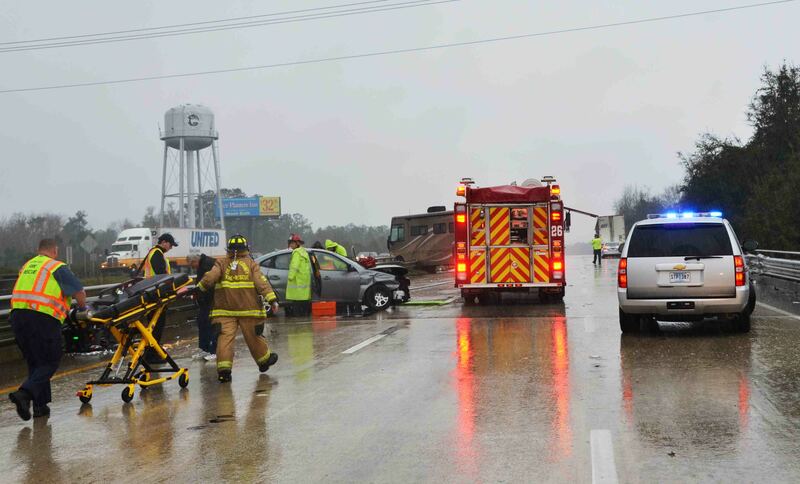 Three people were injured and southbound traffic was brought to a standstill Friday afternoon 23-January following a five vehicle chain reaction accident on I-95 at the Exit 57 overpass. According to bystanders, a car collided with a tractor trailer in heavy rains, which resulted in a motor home impacting the rear of the tractor trailer. Click here for more information. 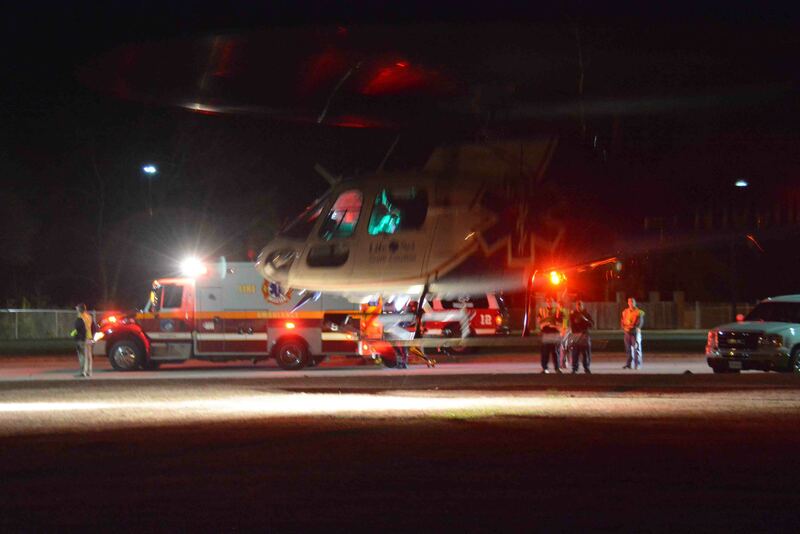 An adult female suffered a critical head injury after falling at her Mount Carmel Home Friday morning 23-January. The incident was reported at 11: 43 in the 800 block. Firefighter-Paramedics began treating the woman and called for additional assistance. 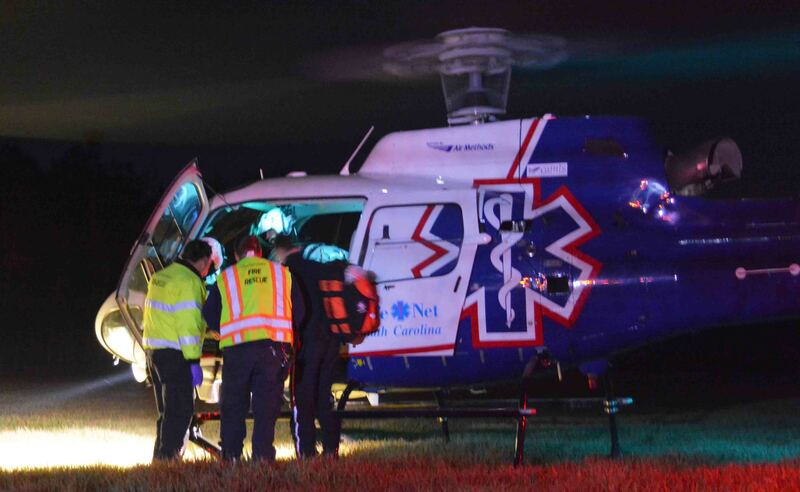 They placed a medical helicopter on standby, while they attempted to stabilize the patient. Click here for more information. A 29 year old Colleton County man died from injuries received in a high speed single car accident in the 100 block of Pine Grove Road, Thursday evening 22-January. The accident was reported at 19:10 after the southbound car left the roadway and struck several trees on the northbound side of the secondary road. The Chevrolet Camaro split into two pieces... click here for more information. 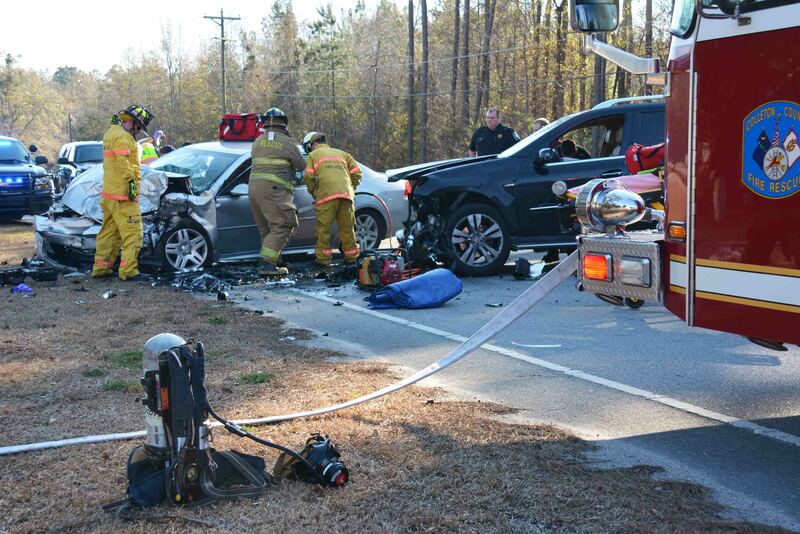 At 14:49 Wednesday afternoon 21-Janaury, Fire-Rescue units responded to the 800 block of Green Pond Hwy for a head-on collision involving two vehicles. Car 107 arrived to find the highway completely blocked by the accident which involved a Mercedes SUV and a small Chevrolet Impala. Both vehicles suffered heavy damage. Firefighters found a 47 year old female unconscious in the Impala. Click here for more information. We are proud to announce that the 4th Annual Emergency Services Softball Tournament will be held on March 7, 2015 at the Colleton County Recreation Center. Players must consist of Fire, EMS, Law Enforcement, Military, Phone/Power Co. If interested in placing a team in the tournament or to obtain more information, contact Brian Drew (843)909-3417 or Robbie McAlhaney (843)560-6187. For Colleton players, please contact either of the above to give us a confirmation of your participation. Firefighters responded to 9307 Augusta Hwy Monday evening 19-January at 21:45 for a structure fire. 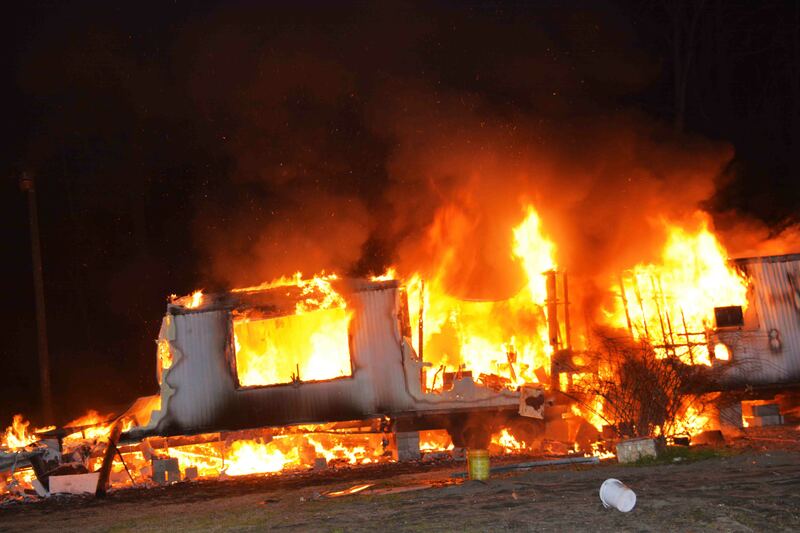 Callers to 9-1-1 reported flames coming out of the windows of a mobile home at that location. Engine 17 arrived minutes later and reported a fully involved singlewide mobile and that the roof had already collapsed. Click here for more information. A 43 year old man was severely injured in a shooting incident Monday evening 19-Janaury. 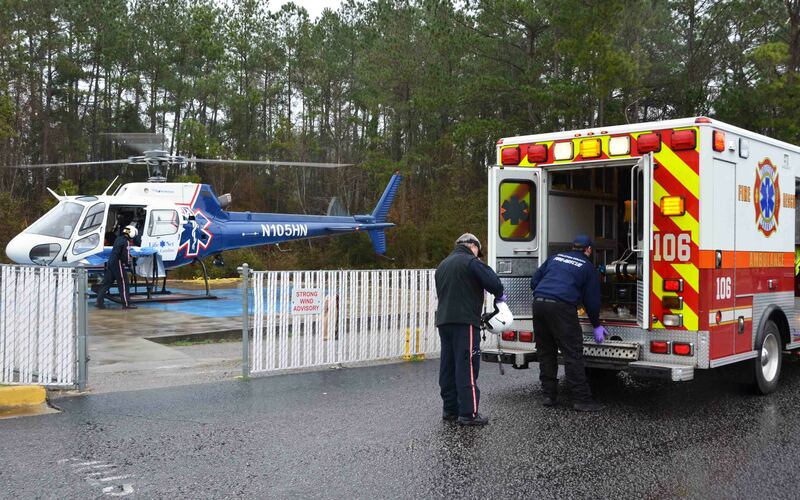 The incident occurred at Jelico’s Landing on US Hwy 17-A in Dorchester County at the Edisto River. The man was reportedly involved in an altercation which resulted in him being shot in the abdomen and arm with a shotgun. Click here for more information. We wish to congratulate Captain Ben Rice and his wife Francesca on the birth of their first child. 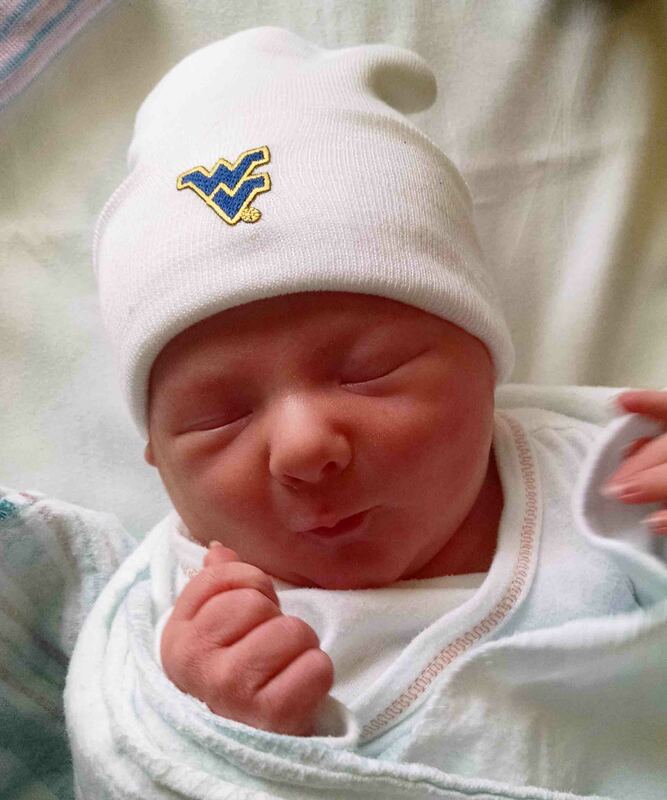 Raelynn Ann Rice was born Wednesday 14-January at 07:21 at Colleton Medical Center. She weighed 7 pounds, 15 ounces and was 20-3/4 inches long. Francesca, Raelynn and Ben are all doing fine. It is with sadness that we announce the death of Captain Chris Jones’ grandfather. Mr. Clifton M Jones was a resident of the Veteran’s Victory House in Colleton County. He was a Navy Veteran, serving during World War II. A graveside service will be conducted Monday, 12-January at 15:00 in Elloree. The arrangements are being handled by Hungerpiller Funeral Home. Please remember Captain Jones and his family in your prayers. Memorials may be made to Hungerpiller Cemetery, c/o Linda Griffin, 262 Horse Pond Road, Elloree, SC 29047. An Oakman Branch family was displaced after their home was destroyed in a late afternoon house fire, Friday evening 09-January, At 16:38, a caller reported the back of the home at 11138 Augusta Highway was ablaze. 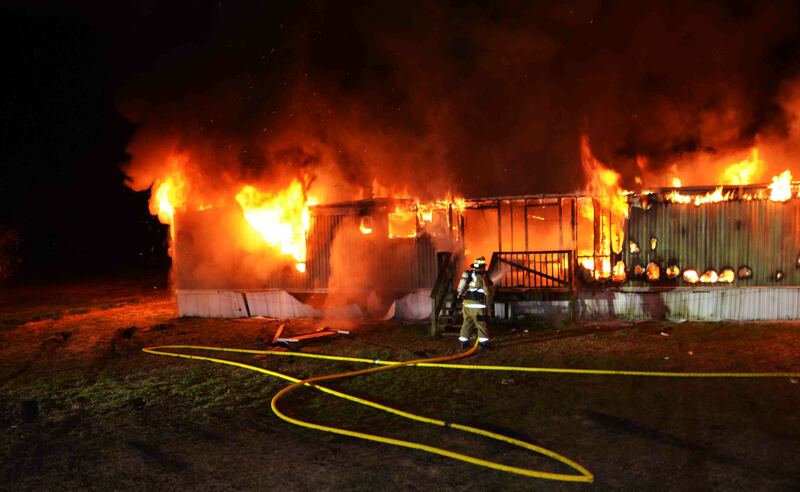 Firefighters arrived to the rural community near I-95 eleven minutes later to find the 4800 square foot two story house fully involved. Click here for information. A Ruffin family of seven, narrowly escaped an early morning house fire at 90 Blaine Court Friday 02-Janaury. At 02:54, 9-1-1 received the first report of the fire. 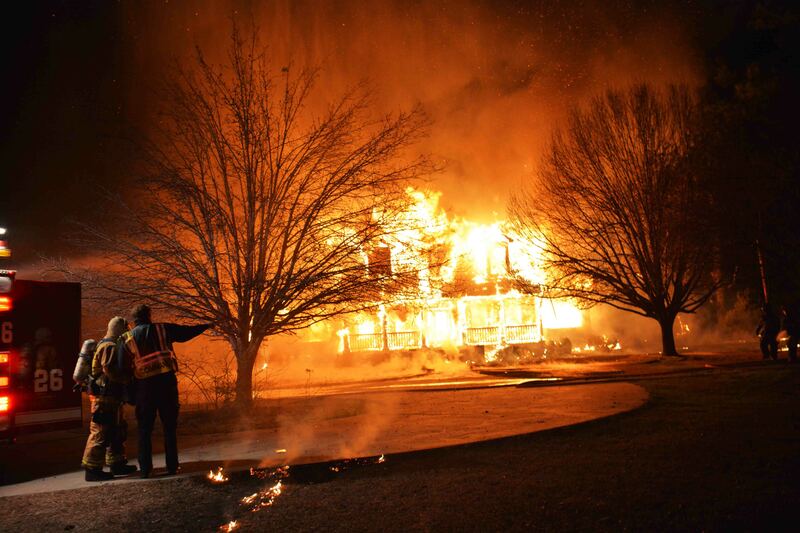 The adult female advised one of the children in the home awakened her noting the house was on fire. She immediately discovered smoke in the residence and found a fire in the wall behind a television set in a small bedroom. Click here for more information.